Tuesday Nylablue had another visit to see Dr Dave and had her Pepcid and Mirtazipine. She had been eating well because of the Mirt;that is good.Diarrhoea started 1/2 hour after getting home and was rushed back to the vets yesterday where she was examined and was given subQ fluid and a Spa bath which she seems to enjoy,Nylablue's mum and the vet decided to go for broke and she was given a double shot of Covenia and a dose of Amoxicillin as Nylablue has a nasty secondary infection in her small bowel the hope is the treatment will kill the infection,But as Nylablue's Mum has said to apologise that she can't visit every ones blogs or answer comments and that they aren't being ignored but her sweet girl needs all her mums care right now. Speedy and My self here will let you all know anything new as we hear it from her mum Sherri-Ellen, updates will be available from Mom Linda at Savannah's Paw Tracks and Bev Fozziemum. Get Well Soon Nylablue Sweet Feet! Thank you for the update on Nylablue and her Mum. We'll be crossing our paws and purring for her to feel better soon. Thank you Rachel & Speedy for your support & devotion to us & to all our friends in the Blog world...we can feel the LOVE!! Hi Rachel & Speedy: Sherri-Ellen here on Sunday evening. Just a quick update for both of you & all your faithful readers here. We hope Nyla gets better soon Speedy. Crossing paws and fingers. We dont know Nylablue. But we really cross our paws and fingers. We hope she will get better. Get better soon Nylablue. Cross my paws. Awww poor thing!!! Get well soon! GOod afternoon my dear friends! I pray with all my heart that Nyla's situation improves quickly. Her mum loves her so, and Rachel and Speedy, you are such good friends. Thank you for caring so much for the forgotten members of society: our dear fur friends. Peace to all! I am sending LOTS and LOTS of purrs to Nylablue and her human! We've all got our paws crossed for Nylablue, we're all praying for you. We are purraying hard for Ms Nyla! Get well Little Nyla, get well. We are praying for Nlyablue. Big hugs and purrs for her and her mom. Oh Speedy, again you have to worry about your friend Nylablue.... our good thoughts are on the way for her and all who love her. 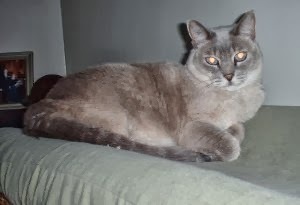 We read about our dear Nylablue's latest battle with her health and have certainly been purring and prayer for her....she's quite a strong spirited girl considering all she goes through. We also purr for her Mum who has done her best to keep Nylablue feeling as good as possible......hopefully Nylablue will pull through this latest ordeal. Speedy that's so nice to write a post for Princess Nylablue. I hope we all together can send her a lot of power and healing purrs and barks so I hope she feels better soon. I am sending purrs for Nylablue too. And I too believe that our furry friends wear wings, from kittys to bunnies, and you Speedboat, are an angel with long ears...how I adore you all! Thank you to you and mummy for your visit. How I wish we could have a cup of tea and one of those cupcakes, together. Packagin' up the first lot of extra-strength healing purrs for Nylablue as we speak. Shipments of purrs will be teleported over every hour on the hour. I'm purrin' and purrin' and PURRIN' that Nylablue feels much better, very soon. Get well soon, Nylablue. I'm sending lots of healing vibes and magic dachshund juju your way. Keeping Nylablue and Sherrie-Ellen in our thoughts! Keep us updated and send our love when you next speak to them! Paws crossed for Nylablue and Mum!